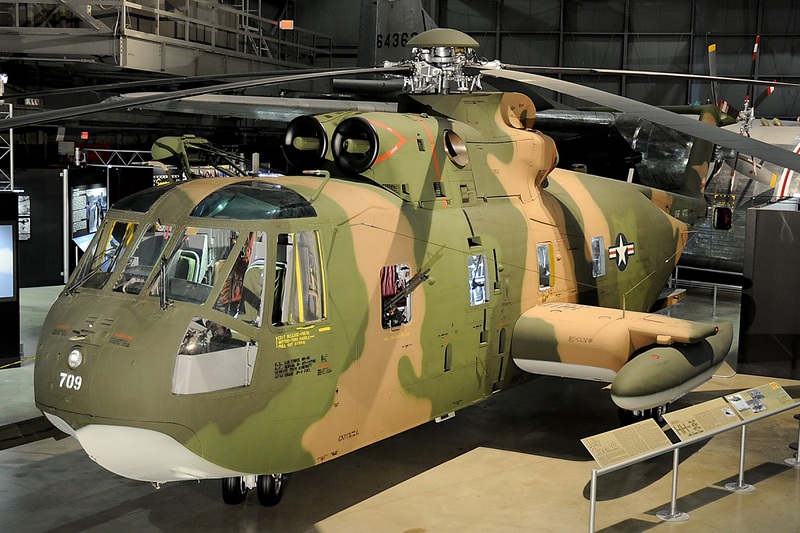 Sikorsky HH-3 "Jolly Green 22" in the Southeast Asia War Gallery at the National Museum of the United States Air Force. 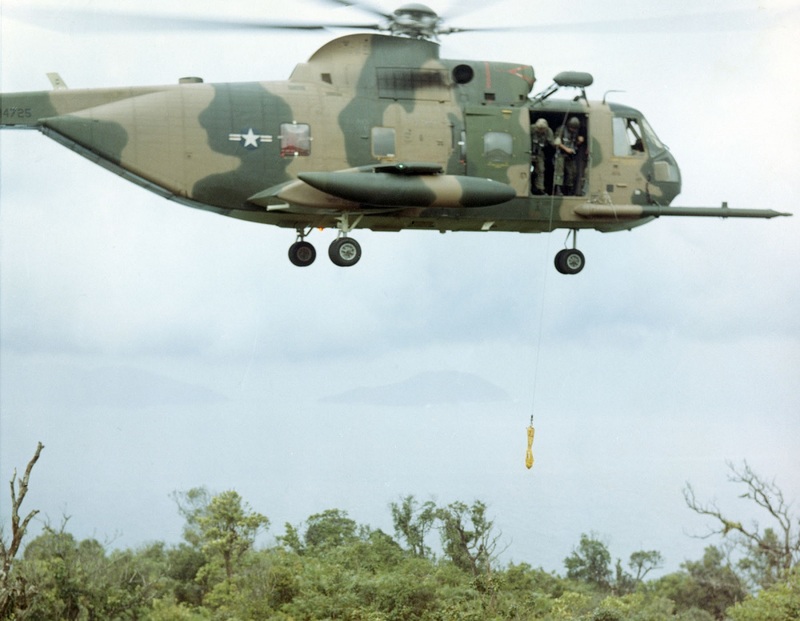 The U.S. Air Force (USAF) developed the Sikorsky HH-3E helicopter, nicknamed the “Jolly Green Giant,” to perform combat search and rescue (CSAR) to recover downed Airmen during the Southeast Asia War. A highly modified version of Sikorsky’s CH-3 transport helicopter, the HH-3E carried both armor plating and armament to protect it from hostile forces during rescues of aircrews in a combat area. Fifty CH-3Es were converted to HH-3Es with the addition of armor, defensive armament, self-sealing fuel tanks and a rescue hoist. With a watertight hull, the HH-3E could land on water, and its large rear door and ramp permitted easy loading and unloading. 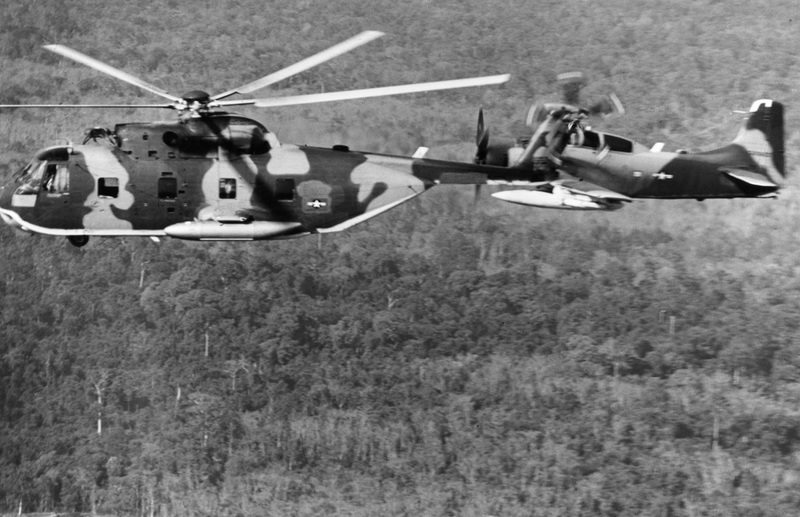 The first USAF HH-3Es arrived in Vietnam in 1967, and they operated out of Udorn Air Base, Thailand, and Da Nang Air Base, South Vietnam. An HH-3E being refueled by an HC-130. 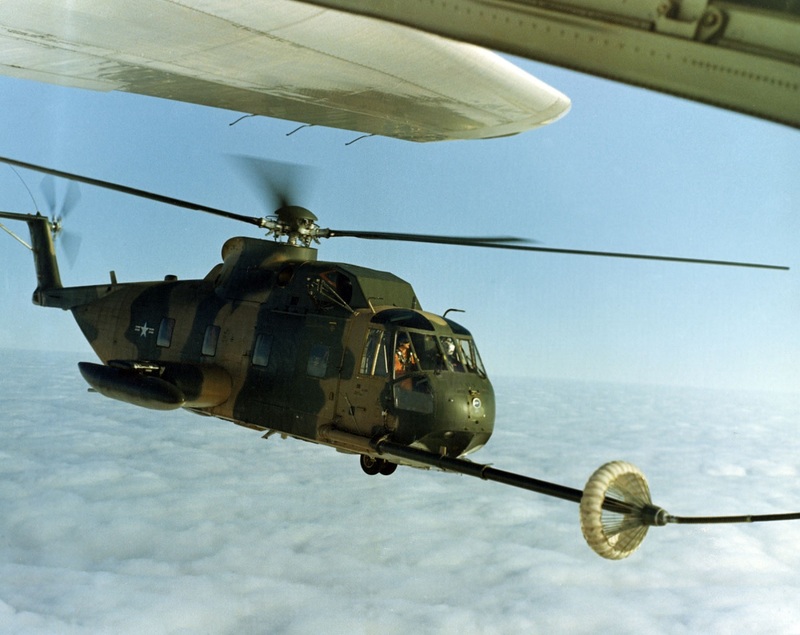 Aerial refueling enabled the helicopters to rescue downed aircrew from any location in the Southeast Asia theater of operations. Today one of these helicopters (the HH-3E serial number 67-14709) is on display at the National Museum of the U.S. Air Force. Noteworthy this HH-3E had a long and distinguished history. Assigned to the 37th Air Rescue and Recovery Squadron at Da Nang Air Base, South Vietnam, it flew with the call sign Jolly Green 22 in the Southeast Asia War. As explained in the article “Jolly Green 22,” on Mar. 14, 1968, a two-ship helicopter rescue team attempted to rescue the aircrew of a U.S. Marine Corps (USMC) F-4 Phantom shot down over North Vietnam. One of the two crewmen was picked up, but heavy enemy machine-gun fire forced the rescuers to withdraw before saving the second Marine. Enemy fire had damaged Jolly Green 22, but its crew made a second attempt to rescue the stranded Marine. Meanwhile, the North Vietnamese had killed the Marine and set up an ambush for the returning rescuers. Despite intense enemy fire, Jolly Green 22 escaped the trap with 68 bullet holes, a shot-out windshield, and holes through the rotor blades. A Jolly Green Giant escorted by an A-1 Skyraider on a CSAR mission in Southeast Asia. For their efforts, the four crew members of the helicopter were nominated for the Air Force Cross, but instead, only three of the crew – the pilot, Maj. Stuart Hoag; the copilot, Lt. Col. Gerald Lowe; and pararescueman Sgt. James Locker – received Silver Stars. The flight engineer, Sgt. Dennis Richardson, who dangerously exposed himself to enemy fire and probably saved the helicopter, received the Purple Heart. However, the Air Force reviewed the documentation of the mission, and in 2008, retired Chief Master Sgt. Richardson received the Air Force Cross for his actions under fire in 1968. During the 32 months this helicopter – also known as “709” from its serial number – served in Southeast Asia, the crewmen assigned to it received one Air Force Cross and fourteen Silver Stars for heroism. Equipped with a powerful external winch, the Jolly Green Giants could extract a downed pilot without landing. Here, an aircrew practices lowering a jungle penetrator. In addition, they were credited with the rescue of 27 American Airmen. After the war, “709” participated in another daring rescue mission in the Yellow Sea. On the night of Mar. 30-31, 1979, Maj. James E. McArdle, Jr., and his crew flew this helicopter to save 28 sailors from the Taiwanese freighter Ta Lai after it ran aground. Fighting 15-foot waves and high winds, the HH-3E crew made three trips delivering the Taiwanese sailors to Kwangju Air Base, South Korea. For this rescue, McArdle received received the 1979 MacKay Trophy, which is awarded for the most meritorious flight of the year by an Air Force person, persons or organization. Retired after Operation Desert Storm in 1991, this historic helicopter was restored by the museum in 2010. 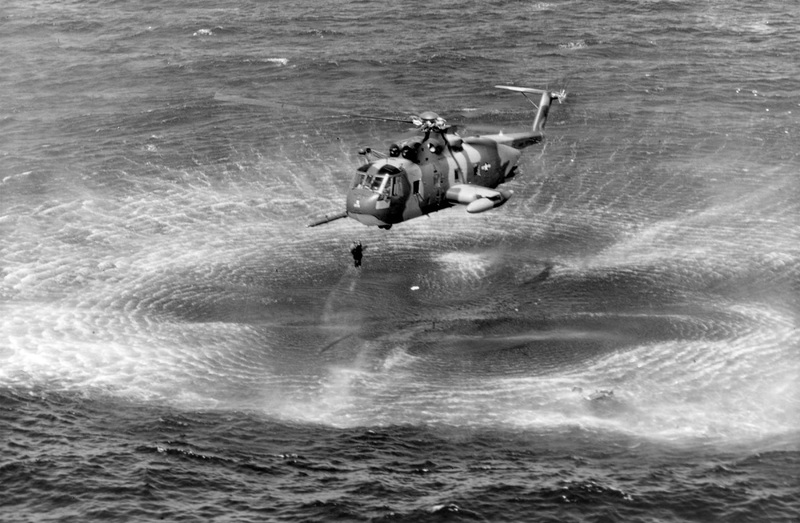 A USAF HH-3E rescues a pilot from the water off the coast of Vietnam.